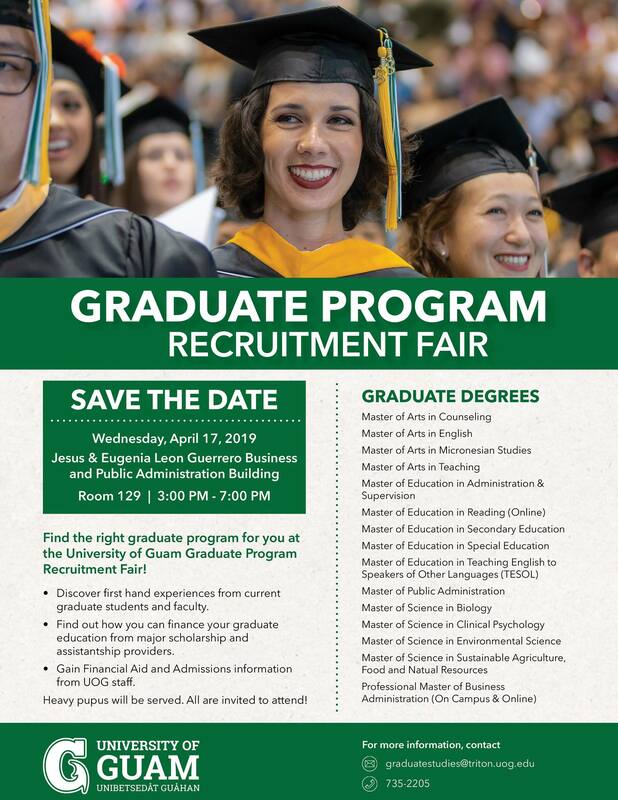 Working professionals, recent college graduates, and others considering a master’s degree now or in the future will have an opportunity to explore 15 options available at the University of Guam through the University’s Fañomnåkan 2019 Graduate Program Recruitment Fair on Wednesday, April 17. The fair is open to the public and will take place from 3 p.m. to 7 p.m. in Multi-Purpose Room 129 of the Jesus & Eugenia Leon Guerrero School of Business & Public Administration Building on the University of Guam campus. The fair will feature tables for each of the graduate programs and will also provide opportunities for attendees to speak first-hand with current graduate students and faculty. Financial aid and admissions assistance will also be available, including information on available scholarships and assistantships. The fair will also feature food and giveaways.